In the iconic film by Robert Zemeckis and Bob Gale, teenage Marty McFly travels back in time from the 1980s to the 1950s, changing the path of his parents' destiny...as well as his own. 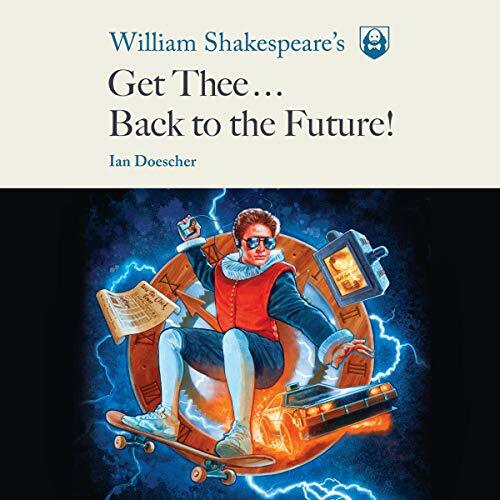 Now fans of the movie can journey back even further - to the 16th century, when the Bard of Avon unveils his latest masterpiece: William Shakespeare's Get Thee Back to the Future! Every scene and line of dialogue from the hit movie is re-created with authentic Shakespearean rhyme, meter, and stage directions. This reimagining also includes jokes and Easter eggs for movie fans, from Huey Lewis call-outs to the inner thoughts of Einstein (the dog). By the time you've finished listening, you'll be convinced that Shakespeare had a time-traveling DeLorean of his own, speeding to our era so he could pen this time-tossed tale. Ian Doescher does to Back to the Future as he did Star Wars. The narrators were brilliant and engaging. I remember bits and pieces from the film, and it was great. This Shakespeare style of it is also excellent. The actor for Marti, or is it Marty does sound a lot like Michael J Fox, not sure if others will notice that.